This book not only combines a graphical approach to learning, but also provides clear visualizations in addtion to the concise reading material. I am well versed in Logic and each time I pick up these books, I learn something knew. It also makes for an excellent reference manual. Perfect book for the beginning who wants to begin to master Logic and learn and understand… How It Works! Highly recommended. Perfect Learning Tool This book has been a great help!! By What a great help!! I'm in the process of switching from DP to Logic and came across these books in the Graphically Enhanced Manuals series. One thing I realized right away are all the graphics and diagrams that you usually don't find in a typical user manual for software apps. I know how a sequencer works, but I had to find out how Logic works differently than the one I'm used to. Those diagrams make it very clear and I'm up and running in no time. This is the way to learn an app. Highly recommended. Edgar Rothermich's Logic Pro X books are wonderful introductions that make a sophisticated program substantially more accessible. I am a professional composer and orchestrator, and I have read a LOT of software manuals. Most manuals are designed as references, and to understand them you usually have to be simultaneously using the software. Rothermich's approach, although technical and precise, is based on a conversational style and is focused on understanding instead of step-by-step how-to instructions. It's highly visual, and as a result nothing is left to the imagination. The end result is books you can read through from top to bottom, gaining an understanding of the software BEFORE fiddling with it. I highly recommend Rothermich's books for the beginner and intermediate user. They are so well organized that they could be the textbook for a semester-long course, but so easy to read that you might get through them in a week. I have many of the books of the “Graphically Enhanced Manuals” series and I have a read of few other (more conventional) books and I must say. These are still the best on the market. No comparison. The interactivity of these Enhanced versions set them even more apart from the rest. Edgar does an excellent job of making a complex program understandable. If you're serious about learning logic buy this book. It's simply the best. This format is great for learning. The visual ascpect is very helpful. Being able to click terms and view definitions is also very helpful. I would highly recommend this book for anyone learning Logic. I'm a experienced Logic user that managed to learn Logic through trial & error, the dreaded Logic Manual, and YouTube. Wish I would have had this back when I started. Really like the visual "show and tell" style of this book...and the fact that it updates itself along with Logic is a godsend! In other books whenever Logic updates with new features you'd have to wait and purchase either an updated book if/when it eventually came out, a separate addendum, or do without. The fact that this actually updates for free along with Logic is unbelievable! As far as I know it's the only Logic book that does this. That alone makes it a great buy. The visual style is also much easier to grasp than the technical lingo you'll find in most other books and Logic's own manual. I'd suggest this book for anybody at the beginner to early/mid intermediate level learning Logic. 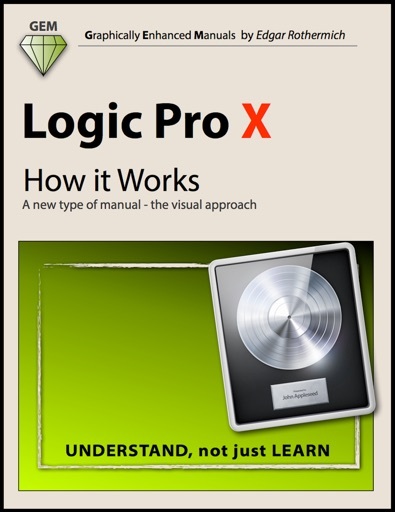 Pro users looking for advanced info (like diving under the hood in the Logic Environment) will find the book to basic for them but the fact that it updates along with Logic could easily make it worth while for even pro users. I can't wait for the advanced volume of this book (Logic Pro X: The Details) to hit iBooks. Really wanna finally start diving under the hood in Logic. Especially the Logic "Environment". Much better that anything Apple has ever written! I was skeptical about this guide because of all the graphics and screen shots (ah, it's just filler), but it's absolutely fantastic. It's easily the best DAW guide I've read. Especially awesome things about it: * It's huge - covers a lot of Logic * The level of detail is just right. It goes into enough depth to satisfy my need to know how it works, but not too much detail, which has been moved to the forthcoming follow-up book. * I really like the chair / instrument / player / stand analogy with the tracks and environment objects. I kind of half-understood things in a nebulous manner beforehand, but it all makes a lot of sense now * It's not a point and click tutorial (check out Apple's Pro Training Series book for that), but an explanation about what the different features, settings, and controls _do_. This is a great second book after you've gone through a tutorial and have actually used Logic for a while. * The author isn't a brainwashed fanboy. There are some inconsistencies, rough corners, and general WTFery, and they get called out as possible sticking points when using the software. This book is so good, I'd buy other editions in the series sight-unseen. When I upgraded to Logic Pro X, I was initially overwhelmed by all the new features, integrated Environment, and other enhancements. I have to say that this book really helped flatten the learning curve of upgrading—after all, the whole point of upgrading any software is to be able to make use of its new features. This book has more than paid for itself in how much better I’ve been able to use my DAW of choice—and how much faster I am at making music. Instabuy.